We bade a fond goodbye to Stan and Pauline, and Ken and Sheila: the Surrey Four who had been on the ship with us for two weeks. We didn't "hang out" together but our paths crossed many times on land and we shared dinners, drinks and conversations on board. They were delightful traveling companions and we are grateful to have made their acquaintance. We also said farewell to our other English friends, Roger and Monika from Hampstead, and Jean and Sid from Nottingham. Then we disembarked, hopped in a taxi, and headed for Hertz. It took a while to get the car because the Italian computer did not show our special quoted price. A call to the reservations people in the States was necessary to resolve the problem to our satisfaction. Finally, we were on the road to Tuscany. We drove along the coast to Grosseto and then headed inland. 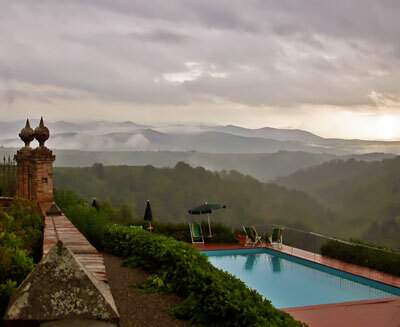 Soon we came upon the rolling hills and vineyards that one associates with Tuscany. But the nearer we got to our destination, the more difficult it became to reach it. Villa Dievole is listed as being in Vagliagli, a small town which shows up on the map. There are even road signs pointing to it. But each turn we made seemed to take us somewhere else. A dirt road finally led us into town. So, we found the town but where is our villa? Vagliagli is just a small village with only a few shops which, in the Italian custom, are never open in the early afternoon. We kept driving around but could find nothing that looked like our villa. Eventually, an elderly lady in a market rescued us. Speaking no English, but using hands, inflection and some Italian words similar to English, she got us going in the right direction. Down an unpaved road was the Villa Dievole. This is a working winery, owned by the same family for many years. They relish their history and many photographs from its past are displayed on walls throughout. When we entered to check in, an old lady insisted we first have a plate of bread and olive oil, and a glass of wine. Many of their wines were on display in a very unusual case. On the patio outside, there was a wine tasting group. It looked like Villa Dievole would be a wonderful base for the next three days. We were asked if we wanted to make a reservation for dinner at the villa and we eagerly said yes. We had been looking forward to the fabled food of Tuscany for months. There was a slight misunderstanding regarding our reservation and we would be in separate rooms for two nights. And because the rooms wouldn't be ready for a couple hours, we headed off to explore Siena. The old city is only a twenty minute drive south, but unfamiliarity with the roads and signs doubled the driving time. There were many tourists on this Saturday afternoon, but as it was getting late and people were beginning to leave, finding a parking space wasn't too difficult. This medieval city is set on three converging steep hills of reddish clay ("burnt Siena") and is almost fully enclosed by massive walls. From almost any gate in the walls, the narrow streets converge toward the Piazza del Campo. The piazza is shaped like a big fan, sloping down to the entrance of the Palazzo Publico (Town Hall). Around the edge of the piazza were many restaurants with outdoor tables. When we arrived, a large sound stage was being set up in front of the Palazzo for a rock concert to be held later tonight. Teenage girls had already staked out their space right in front of the stage as hunky shirtless stagehands were hanging giant speakers. We came across the Museo dell'Opera Metropolitania, which houses all the extra art that used to be in the cathedral. 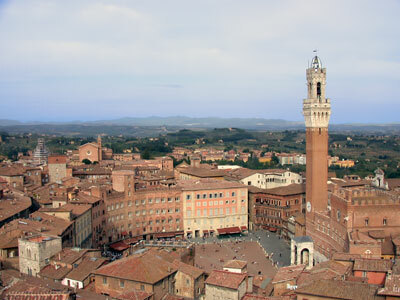 We climbed up its tower which offers a panoramic view of Siena's "jigsaw puzzle" of roofs and streets, as well as the surrounding countryside. Even with a cloudy sky, the view was stunning. It was a long climb up narrow and winding stairs (tough if someone was coming down at the same time). We then continued our walk through the narrow streets, stopping in several which specialized in ceramics. Beautiful stuff! 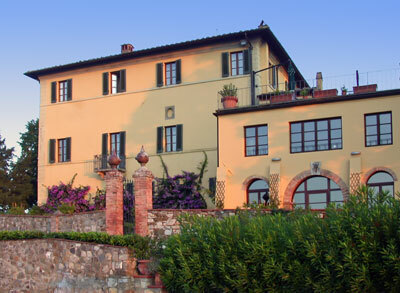 We drove back to the Villa Dievole and moved into our rooms. Each room had three complimentary bottles of wine, an extremely generous touch. Then, a walk around the grounds. Very tranquil, with a large tree-covered yard filled with flowers and other plants. We took one of our complimentary bottles of wine and sat for a while. A small dog and two cats, masters of this domain, checked us out and gave their approval. Below the garden is a swimming pool and, beyond, a valley, vineyards, and more hills. Peaceful. We were now looking forward to a wonderful Tuscan meal. We went to the dining room and found it full of people enjoying a fine meal. But. This was a special wine tasting group. We would have to eat in the "other" dining room across the patio. We entered a large quiet room with a long oval table. A solitary couple sat at one end, just beginning their meal in candlelight. Assuming they wanted to dine alone, we moved to the other end of the table. Along with the menu, the waitress brought our own candle. So we ate, at this long table, two people at each end, in candlelight, with a dozen pairs of eyes staring at us. Ah yes, the walls were covered with large faces, photos of the faces of workers from the villa, huge smiling Avedon-type faces complete with pores. These would be enjoyable to look at in other circumstances but rather disconcerting at dinner. And after all of this, the meal was just average, nothing special. Is this real Tuscan cooking?